In recent years, the Patent Office has implemented training to get examiners to state on the record not only when claim language is understood to invoke 112(f)/112(¶6), but also when close language is understood not to do so. This results in the curious office actions every now and again where an examiner expressly states that claim language (that does not recite “means”) is not understood to be means plus function language. The situation is similar to when an examiner states the reasons why a claim is allowable in a notice of allowance. 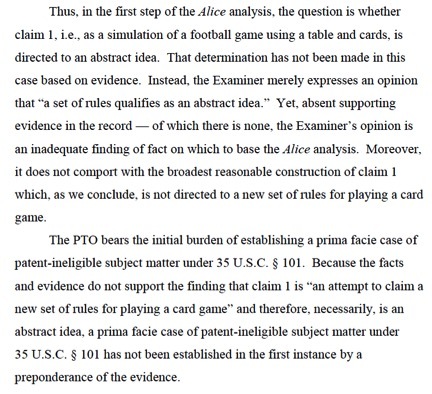 The patent prosecutor is happy that the claims have been allowed, but he/she doesn’t particularly want the claims to be colored by the Examiner’s statements. What many prosecutors have done in regard to the notice of allowance issue is to submit a paper that indicates that the Applicant believes that the claims are allowable because of the claim language as a whole and not necessarily due to any particular feature. This is done to reduce the possibility that the Applicant could be accused of having agreed to or acquiesced to the Examiner’s view. I suspect that a similar approach will be taken by prosecutors with respect to the 112 statements, in the future. Namely, a boilerplate response statement will be fashioned that shows on the record that the Applicant did not acquiesce to the Office’s interpretation. PROCTER & GAMBLE COMPANY, Defendant-Appellee. No. 04-1013.United States Court of Appeals, Federal Circuit. July 8, 2005.1343*1343 Henry C. Su, Fenwick & West LLP, of Mountain View, California, argued for plaintiff-appellant. With him on the brief were Brenda M. Simon and Kent Kemeny. Charles J. Faruki, Faruki Ireland & Cox P.L.L., of Dayton, Ohio, argued for defendant-appellee. With him on the brief was Thomas R. Kraemer. Before RADER, BRYSON, and GAJARSA, Circuit Judges. Opinion for the court filed by Circuit Judge RADER. Dissenting opinion filed by Circuit Judge BRYSON. Alfred Salazar owns U.S. Patent No. 5,535,474 (‘474 patent) for a toothbrush having polishing rods that clean and polish the teeth and stimulator rods that stimulate the gums during brushing. ‘474 patent, Abstract. Salazar, acting pro se,sued Procter & Gamble Co. (Procter & Gamble) for infringement of the ‘474 patent. Procter & Gamble moved for summary judgment because its toothbrushes do not include the “elastic” feature of claim 1, the only independent claim of the ‘474 patent. On September 8, 2003, the district court issued an order construing the “elastic” limitation and granting summary judgment to Procter & Gamble because its products do not infringe literally or under the doctrine of equivalents. Salazar v. Procter & Gamble Co., No. 02-CV-590-C (N.D.Okla. Sept. 8, 2003) (Order). Because the district court erred in using the patent examiner’s Reasons of Allowance to exclude nylon from the scope of the claim term “elastic,” this court vacates the grant of summary judgment and remands. Mr. Salazar submitted U.S. Patent Application No. 409,149 (‘149 application) on March 23, 1995, which eventually matured into the ‘474 patent. The ‘474 patent claims a toothbrush with, inter alia, elastic stimulator rods and elastic polishing rods that extend above the bristles of the brush. ‘474 patent, col. 5, I. 30 — col. 6, I. 23. The ‘149 application initially contained an independent claim 1 and five dependent claims. Claim 2 of the ‘149 application depended from claim 1; and claim 3 from claim 2. The examiner rejected claim 1 as obvious over U.S. Patent No. 3,072,944 (issued Jan. 15, 1963) to Clayton (Clayton) in light of U.S. Patent No. 3,103,679 (issued Sept. 17, 1963) to Clemens (Clemens). The examiner objected to claims 2 and 3 as allowable subject matter dependent upon a rejected base claim. Claim 7 now incorporates previously held allowable subject matter. . . . Although the patent to Clemens appears to have the recited structure, Clemens’ “rods” 22 are made of nylon, which is not considered “elastic”. Obviously the “rods” of Clemens are flexible, but are not considered to be “elastic” as recited by the claim. The applicant did not respond to these remarks by the examiner. The ‘474 patent issued with claim 7 renumbered as claim 1. 1344*1344 Mr. Salazar sued Procter & Gamble alleging infringement of certain claims of the ‘474 patent. Procter & Gamble filed a motion for summary judgment of no infringement either literally or under the doctrine of equivalents. Procter & Gamble contended that the stimulator and polishing rods in its products are not “elastic” as required by claim 1. The district court construed the term “elastic” and granted Procter & Gamble’s motion for summary judgment. Order at 5 & 7. Specifically, the district court construed the term “elastic” as “any material other than nylon, capable of returning to an initial state or form after deformation.” Order at 5 (internal quotation and citation omitted). The district court granted summary judgment of no infringement because Mr. Salazar did not present sufficient evidence to raise an issue of fact about the elasticity of the stimulator and polishing rods in the accused products. Id. at 7. Thus, the district court concluded that the accused products did not fall within the court’s interpretation of the claim term “elastic.” Id. The district court also found that the doctrine of prosecution history estoppel barred Mr. Salazar from asserting infringement of the “elastic” limitation under the doctrine of equivalents. Id. at 6. Mr. Salazar appeals. A determination of infringement requires a proper interpretation of the scope and meaning of the claim followed by a comparison of the accused product to that claim scope. Omega Eng’g, Inc. v. Raytek Corp., 334 F.3d 1314, 1320 (Fed. Cir.2003); Carroll Touch, Inc. v. Electro Mech. Sys., Inc., 15 F.3d 1573, 1576 (Fed. Cir.1993). In the context of a grant of summary judgment of no infringement, this court reviews the entire infringement inquiry without deference. Omega Eng’g, 334 F.3d at 1320. “Summary judgment is therefore appropriate when there is no genuine issue of material fact or when, drawing all factual inferences in favor of the nonmoving party, no `reasonable jury could return a verdict for the nonmoving party. '” Id. (citing Anderson v. Liberty Lobby, Inc., 477 U.S. 242, 248, 106 S.Ct. 2505, 91 L.Ed.2d 202 (1986)). In construing claims, “[t]his court … considers the prosecution history to determine whether the applicant clearly and unambiguously disclaimed or disavowed any interpretation during prosecution in order to obtain claim allowance.” 3M Innovative Props. Co. v. Avery Dennison Corp., 350 F.3d 1365, 1371 (Fed.Cir. 2003) (internal quotations and alterations omitted); accord Omega Eng’g, 334 F.3d at 1324; Middleton, Inc. v. Minn. Mining & Mfg. Co., 311 F.3d 1384, 1388 (Fed.Cir. 2002); Standard Oil Co. v. Am. Cyanamid Co., 774 F.2d 448, 452 (Fed.Cir.1985). The doctrine of prosecution history estoppel serves to limit the doctrine of equivalents when the applicant makes a narrowing amendment for purposes of patentability, or clearly and unmistakably surrenders subject matter by arguments made to the examiner. See Festo Corp. v. Shoketsu Kinzoku Kogyo Kabushiki Co.,535 U.S. 722, 736, 122 S.Ct. 1831, 152 L.Ed.2d 944 (2002) (narrowing amendment for purposes of patentability); Eagle Comtronics, Inc. v. Arrow Communication Labs., Inc., 305 F.3d 1303, 1316 (Fed.Cir. 2002) (argument-based estoppel); Elkay Mfg. Co. v. EBCO Mfg. Co., 192 F.3d 973, 979 (Fed.Cir.1999)(argument-based estoppel). The first and only time the examiner discussed the “elastic” limitation was in the Examiner’s Statement of Reasons for Allowance. The examiner did not at any time reject a claim of the ‘149 application containing the “elastic” limitation as anticipated 1345*1345 or obvious in view of the prior art. Other than the remarks in the Examiner’s Statement of Reasons for Allowance, the prosecution history does not contain any discussion of the “elastic” limitation by either the examiner or the applicant. Nonetheless, the district court excluded nylon from the scope of “elastic.” Order at 5. Specifically, the district court found that the remarks in the Examiner’s Statement of Reasons for Allowance “amended the claim specifically to exclude nylon from the definition of `elastic. '” Id. Thus, this appeal requires this court to decide whether unilateral statements of an examiner in stating reasons for allowance can create a clear and unambiguous disavowal of claim scope and give rise to prosecution history estoppel. It is interesting to look back at the comments as well as the companies represented and the folks who made the comments. The transcripts of the proceedings are available [here] and [here]. Judge Nina Wang is one of the few patent litigators to have ascended to the federal judiciary. She serves as a US magistrate judge here in Denver, CO. You can read one of her recent recommendations on patent eligibility issues from Brain Synergy Institute, LLC v. Ultrathera Technologies, Inc. [here]. Judge Sri Srinivasan of the D.C. Circuit has been mentioned as a front-runner to fill Justice Scalia’s seat on the Supreme Court. Judge Srinivasan and Federal Circuit Judge Richard Taranto were advocates on opposite sides of the case Hynix Semiconductor, Inc., et al. v. Rambus Inc., 645 F.3d 1336 (Fed. Cir. 2011), before they took seats on their respective courts. You can listen to that oral argument here: [Listen]. The patent issued as US Patent 9,114,310. You are currently browsing the 717 Madison Place blog archives for February, 2016.